We’ve been making the rounds ever since our launch party last May at 92YTribeca. That was a fun and fascinating evening thanks to our panelists John Scher, Eric Baker, Mike Luba and Andrew Dreskin. 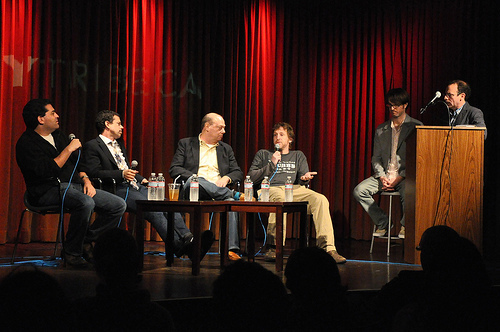 Here’s a photo from the panel, courtesy of 92YTribeca. A few weeks later at Bonnaroo we hosted a second panel, with festival co-founders Ashley Capps (AC Entertainment) and Jonathan Mayers (Superfly Presents) as well as Buck Williams (Progressive Global Agency)and Patrick Jordan (Red Light Management) . Over the months that followed we spoke on Ticket Masters in a variety of forums, including an appearance at Norway’s by:Larm Festival, as well as: CMJ Music Marathon, Ticket Summit, the Intix Conference (International Ticketing Association), Leadership Music Touring Day, Drexel University and William Patterson University. If you’re interested in having us appear at an event please just let us know.